An excellent article by AlterNet lists the ‘creepy technology’ used in American schools. Maybe this is what the UK schools market has in store for our children. San Antonio is taking its cue [tracking kids with RFID] from the Houston, TX, school district. It began using RFID chips to monitor students on 13 campuses in 2004. Houston’s Spring Independent School District gave 28,000 students RFID badges to record when they get on and off school buses. The police and school administrators provided the badges to ostensibly prevent truancy and child abductions. GPS TRACKING FOR DELINQUENT KIDS – In Anaheim (CA), about 75 seventh- and eighth-graders from Dale and South Junior High Schools are taking part in the pilot program. Students with four or more unexcused absences have “volunteered” to carry a handheld GPS device. Participation in the program will enable the students to avoid being prosecuted and a potential stay in juvenile hall. Each school day, the delinquent students get an automated “wake-up” phone call reminding them that they need to get to school on time. In addition, five times a day they are required to enter a code that tracks their locations: as they leave for school, when they arrive at school, at lunchtime, when they leave school and at 8pm. The above comes from the excellent article in AlterNet, link at the top of this post. Here in the UK biometric technology and privacy issues have recently been considered fully with the recent Protection of Freedoms Act passed in May 2012 detailing parental consent required when schools process a childs biometrics. As of September 2013 schools in the UK using biometric systems need written parental consent for the child to participate in the system. The school cannot discriminate against the child if they choose not to use biometrics and an alternative method must be found. In a school of say 1500 pupils, the job of writing to both parents and obtaining written consent from one parent, for all students using a biometric system may prove cumbersome. Perhaps the alternative GSP or RFID may be considered here in the UK. 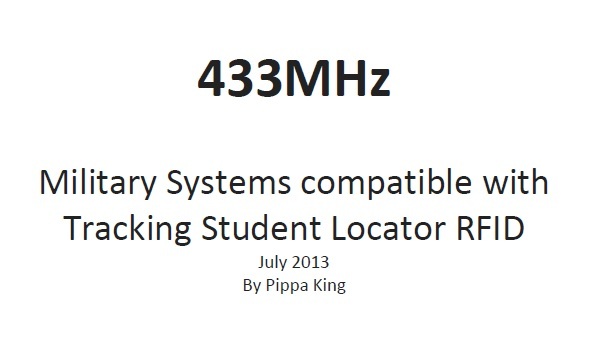 Both RFID and GPS technologies are void in UK schools here at the moment. This entry was posted in GPS, Health, RFID clothing, RFID school, RFID tracking, UK, USA and tagged GPs phone, GPS tracking, Health, RFID tracking. Bookmark the permalink.